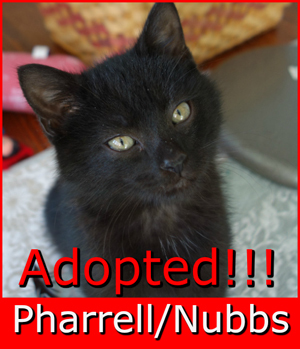 And Pharrell, aka King Nubbs of Nubbington, aka Nubbs. 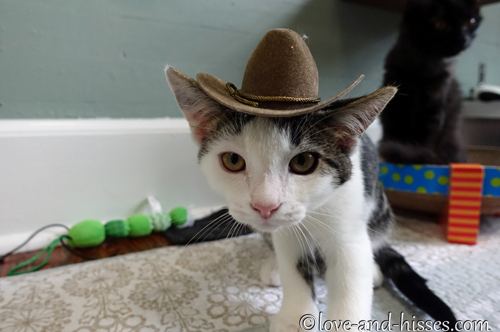 On January 4th, I posted one of my favorite pictures of the year – I was hanging out with the kittens, my phone was set on “panoramic”, and I didn’t realize it, giving me this picture of Shelton. 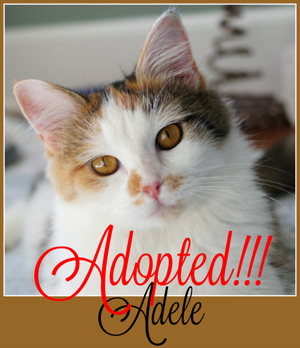 Adele and Pink went off to Petsmart on January 5th. 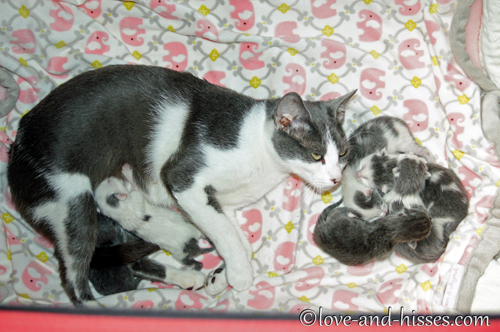 The same night, Kathie dropped off the BeeBees (Combo, Skinny Pete, and Badger), and their foster sister Twig. The Coaches did their very best jumping bean impressions. 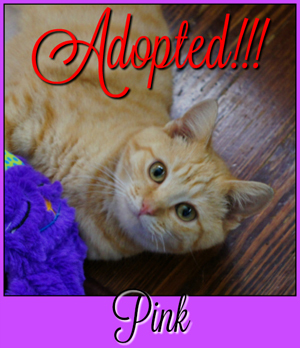 Pink, Badger and Skinny Pete were all adopted on the same night, separately. 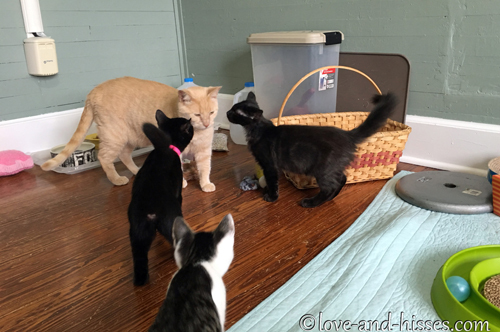 In the same post, King Nubbs got to meet his new partners for a little while. They were very sniffy, and he was a little intimidated. Then he suggested that they might want to back off. 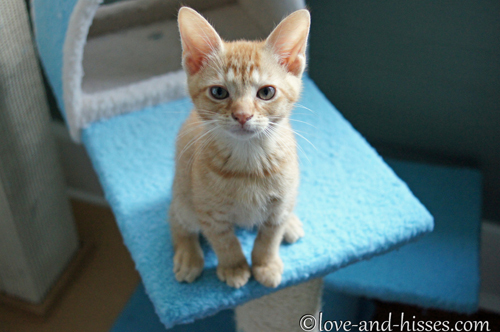 There was NO drama at all, and so we left Nubbs with his new siblings. Fred took this picture a few hours after they’d been introduced. On the 12th, I posted another of my favorite pictures, this one of Stefani. That girl was such a little nutball. 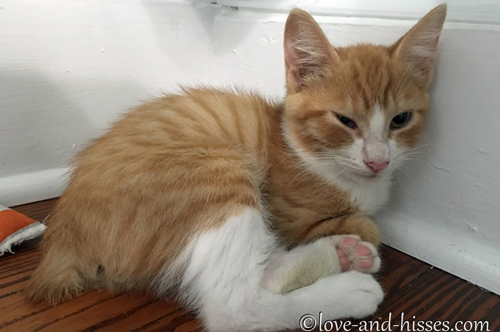 The Coaches went off for their spay and neuters, ordinarily a little younger than I take the fosters, but I wanted to have Nubbs’s tail-nub looked at and thought I’d kill two birds with one stone. The vet opted to amputate the end of Nubbs’s tail (it was just vertebrae covered in scabs) and it immediately looked SO much better. In the same post, I asked y’all to keep True Blood Bill in your thoughts. 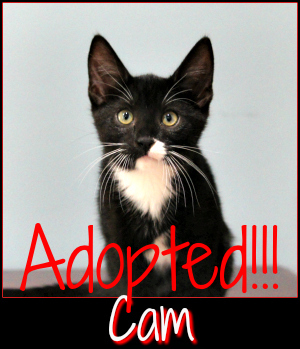 He had to have emergency surgery for a blockage; they performed a cystotomy and Perineal Urethrostomy (PU). Thankfully, Bill came through his surgery just fine, and has proven to be a wonderful big brudder. You can see them all on their Instagram page. 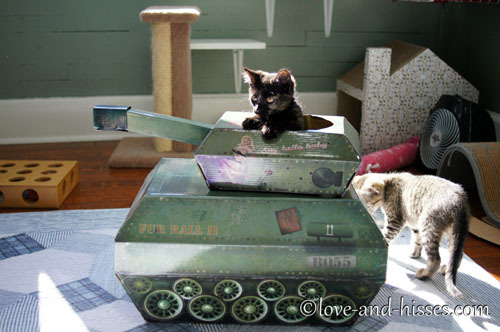 In that very same action-packed post, Stefani received her long-awaited tank and planned world takeover. In the January 19th post, the Coaches got visits not only from Uncle Stefan but also Uncle Archie, and it made them very confused and in need of their Stranger Danger suits. This picture of Shelton killed me dead. 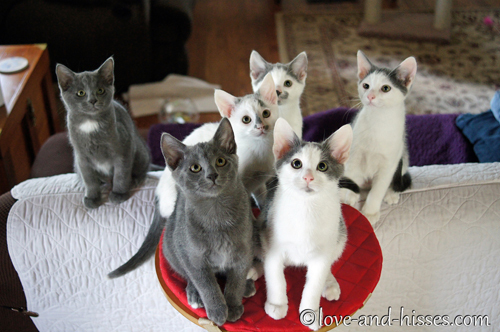 Listen, this litter was so photogenic that I could post every single picture I took of them. In January 21st’s post, I listed the reasons why I thought she’d go into labor soon vs. why we had a wait. Note that I didn’t even hint at the idea that she might not be pregnant. I mean, come on – the vet’s office SAID she was pregnant. I wasn’t going to question that! They know what they’re talking about, right? Pffft. 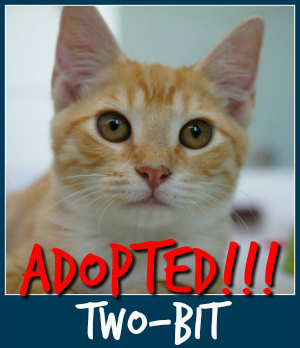 Combo was adopted – that meant that all three BeeBees had been adopted. I posted a page with pictures on the progression of Nubbs’s tail, since some people wanted to see it. It looked pretty gnarly at first, so skip it if you’re one of those sensitive types. 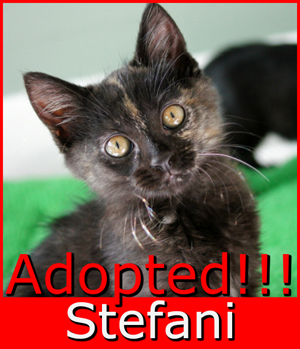 The Coaches (Stefani, Levine, Shelton & Nubbs) went off to Petsmart on the 29th, and on February 1st I posted that Stefani had been adopted. 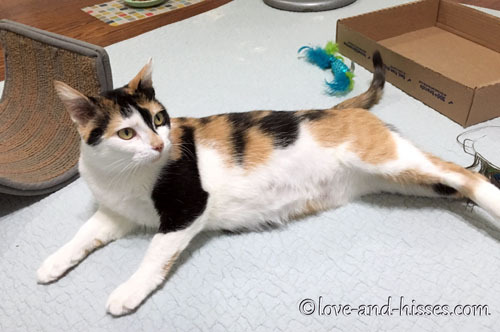 I also posted this picture of Koko and pointed out that she was really filling out and surely birth was imminent. Gee, I wonder why she was filling out so much? 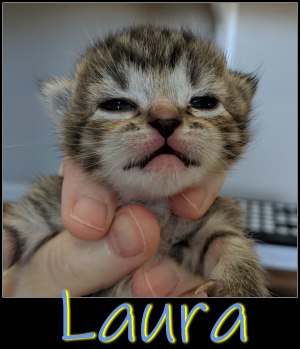 SUCH A (two snacks a day and all the kitten food she could cram down her throat) MYSTERY. This caption cracks me UP. I never watched CSI:Miami, but I understand that this is the look Horatio would get on his face right before he put on his sunglasses and spit out his one-liner. February 11th, brought us the HARD, COLD TRUTH. I took her to a local vet with an ultrasound machine, and it was determined pretty quickly that there were no babies in there. I dropped her off at the vet Challenger’s House uses so that she could spend the night and then be spayed the next day. I also posted another in-heat video. Turn it way up to get the full effect. 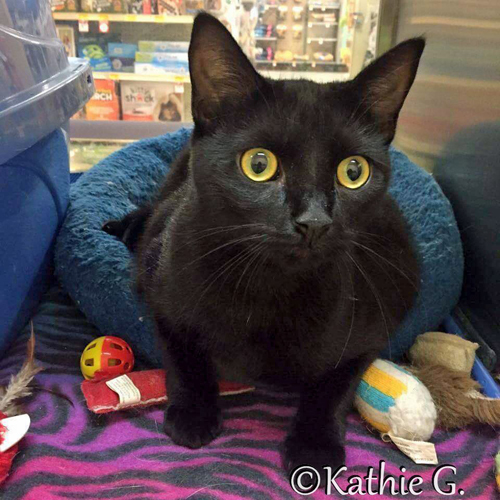 Koko went to Petsmart and initially settled in pretty well, but then started to get stressed after a few days. 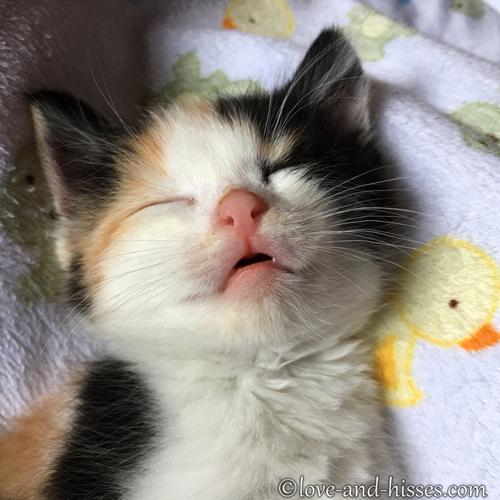 Luckily, she was adopted pretty quickly. 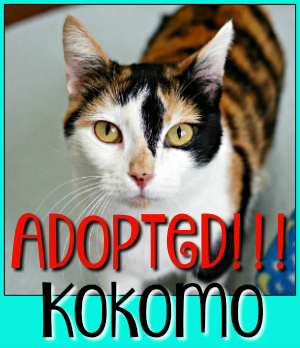 Unfortunately Levine, who had been adopted the night Koko went to Petsmart, was returned. He went into the cage with Nubbs and Shelton, there was a hiss, and then they started playing. So he wasn’t too traumatized, I guess! 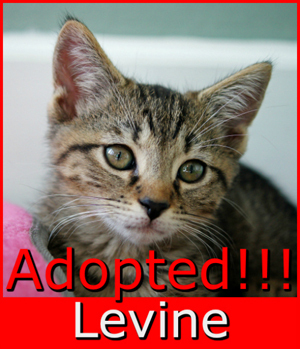 Then Shelton and Levine were adopted – together! 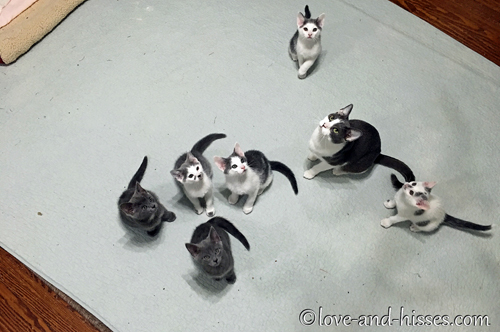 With great excitement, I announced on March 7th that THERE WERE KITTENS IN THE FOSTER ROOM. 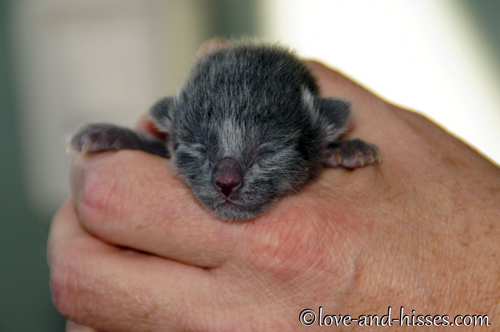 Not only kittens, but WEE BABY KITTENS. 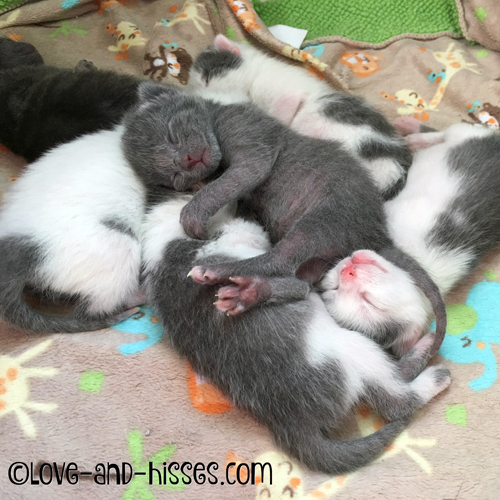 Newborns! 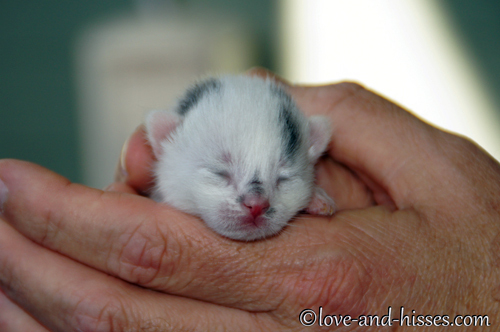 Well, nearly newborns – they were three days old. This, of course, was Regina Phalange and her babies. On March 8th, you got to meet each of the Fakers. Ken Adams turned out to be a ittle hisser. On March 16th, I posted the Fakers’ 2-week-old pictures and we all died from the cute. 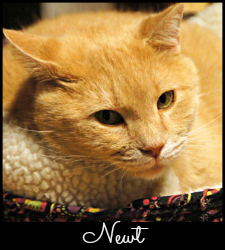 On March 18th, I posted that after TWO MONTHS at Petsmart, Nubbs was FINALLY adopted. About time! 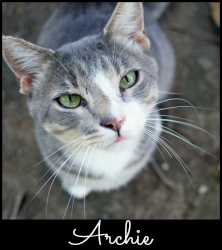 Also on March 18th, I posted a link to the Challenger’s House Facebook post that Elijah, who was my foster back in 2009 along with his six brothers and sisters, had been returned. They were collectively known as The Seven. 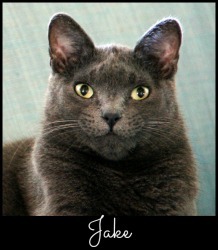 You might remember his litter from this picture. 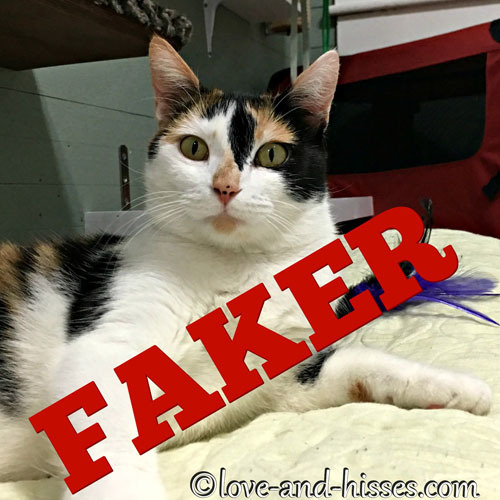 The Fakers turned three weeks old, and I posted their progression pictures on March 23rd. I was just starting to wonder if the Fakers would ever leave their crate – they were certainly old enough! – and finally they did. I got some video proof. 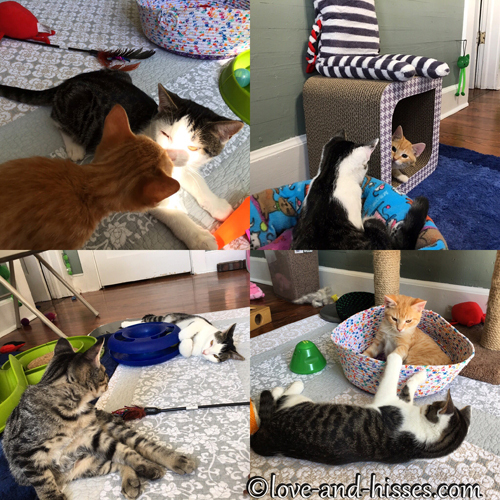 The kittens continued to grow – as kittens insist on doing – and in March 29th’s post I mentioned that they were doing pretty well with this whole litter box usage thing. 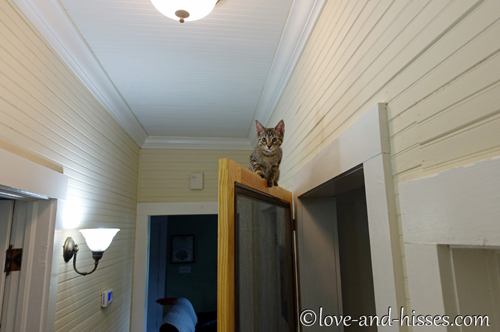 On April 2nd, Stinkerbelle didn’t come down from her post atop the cabinets. 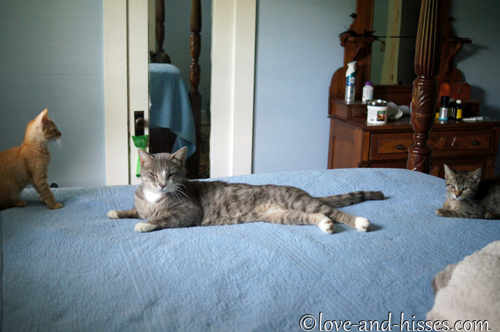 Fred climbed up to see what was going on, and found her curled up in her usual spot, still and looking peaceful. I posted a tribute to her on April 4th. I think it’s safe to say that she died from a broken heart – she was never really the same once her beloved Tommy was gone. 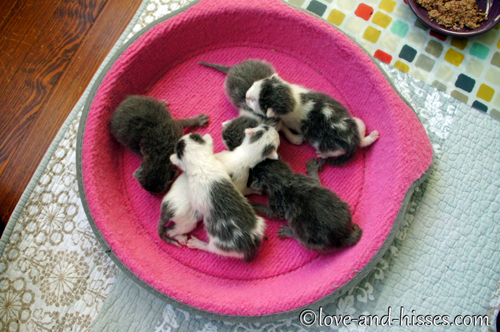 The Fakers turned 5 weeks old, so naturally I finally posted their 4-week progression pictures on April 5th. 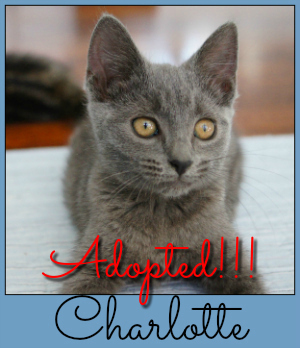 I also mentioned that they were turning out to be champion litter box users (always a plus). 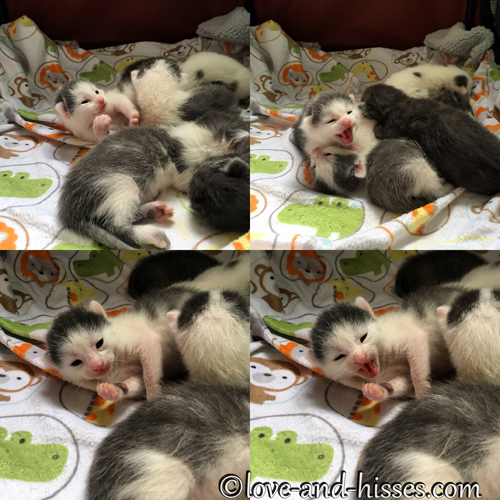 The Fakers went on to turn 6 weeks old – amazing how that happens – and so I posted pictures of them from all angles in the April 13th post. My parents came to visit for a few days and brought their dog Molly with them, leading the cats to pretty much vamoose. There were more pictures on April 21st. 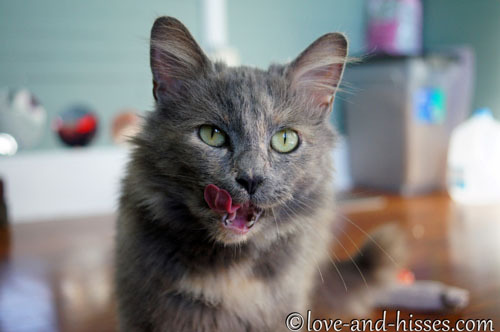 That Molly certainly is photogenic. 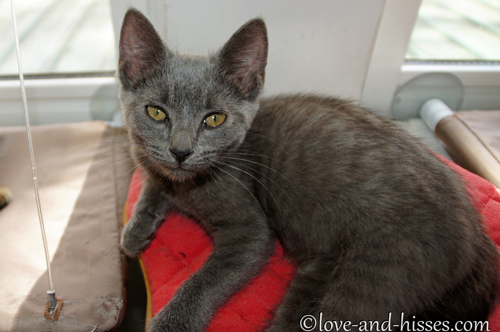 In that same post, I wrote about Regina Phalange being in heat and that she was headed off to be spayed. Apparently 2016 was my year to deal with in-heat girl kitties! 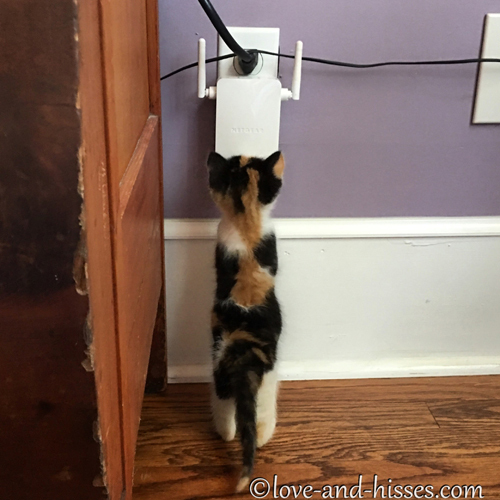 Regina came through her spay just fine, and we set her up in the upstairs bathroom for a few days before letting her go back into the room with her kittens. 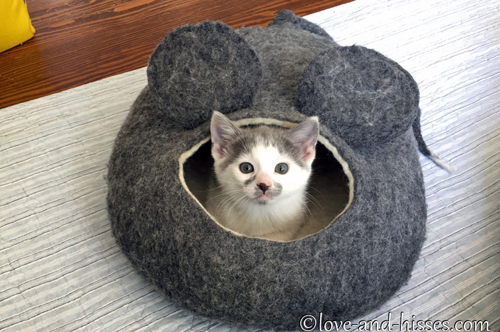 The kittens were gifted with a felted mouse cave, and Susie especially thought it was the Most! Awesome! Thing! Ever! 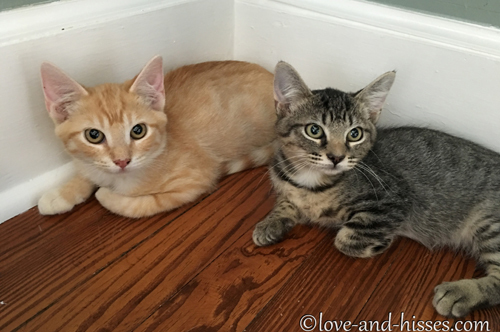 While Regina was off being spayed, Fred decided that the Fakers needed a visitor, and he let Archie in to visit with the kittens. There was so. Much. FLOOF. I posted about that on April 26th. 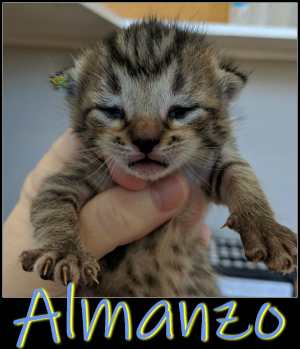 The Fakers turned 8 weeks old, and I posted their progression pictures in the April 27th post. Then on May 2nd, I posted their 1 week old pictures next to their two month old pictures. 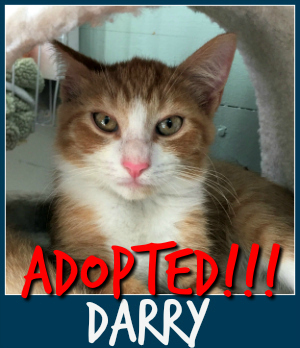 Also in the May 2nd post, I announced the awesome news that – even though they had nearly a month before they were ready – Art Vandelay and Bert Macklin had been adopted. Together! 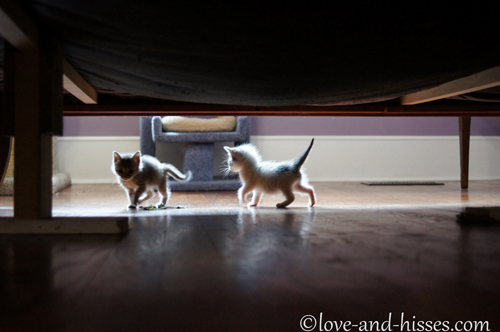 In honor of their 2-month birthday, we put the screen door up at the bottom of the stairway, and let the kittens and Regina have the run of the upstairs during the day. There were pictures of them enjoying their freedom in this post. This picture of Art Vandelay with a feather stuck to his tongue is one of my favorites from this year. There’s actually a series of them posted in the May 4th entry. 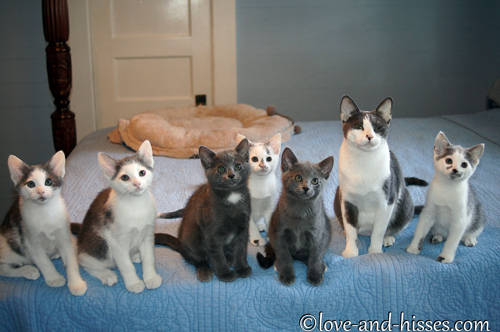 I posted a family portrait in May 5th’s post (those kittens were suddenly HUGE, relatively speaking). There was a series of family portraits in the May 11th post. This is my favorite. 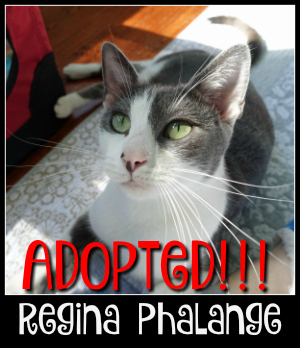 On May 12th, Regina Phalange packed her bags and headed to Petsmart. She settled in well, and I suspect she enjoyed having some kitten-free time. 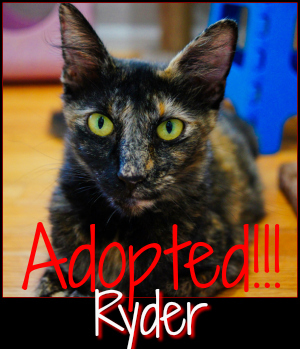 In May 16th’s post, I announced that two more Fakers had been adopted together! This meant that of the 7 Fakers (if you included mama Regina in that total), more than half had been adopted before they were even ready to go. How awesome is that? 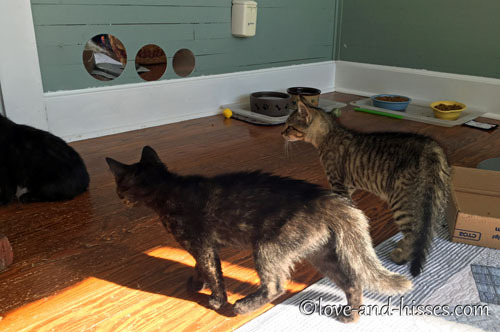 May 17th’s post chronicled the first time Stefan visited the kittens, and there were a lot of Stranger Danger suits in that foster room. I love this Faker lineup from May 18th. Susie, Art Vandelay, Princess Consuela, Ken Adams, Bert Macklin and Chanandler Bong. 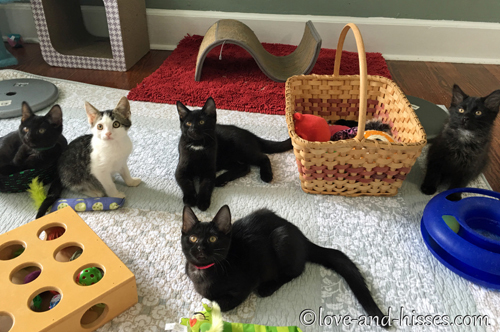 On May 30th I wrote about how all the kittens went off to Petsmart, and the adoption of Art Vandelay and Bert Macklin (now Patches and Periwinkle) and the adoption of Susie and Princess Consuela (now Emma Rose and Emily Rose) went just fine. There was one last family portrait before they went. 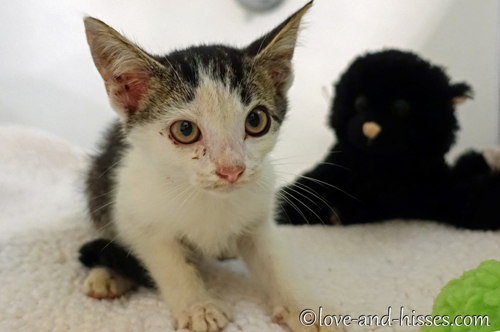 Teresa reported that she was suckered in by the fact that mama Regina Phalange (who still had not yet been adopted) was pressing her face desperately against the bars of her cage looking as though she was dying to be with her two kittens, Ken Adams and Chanandler Bong. 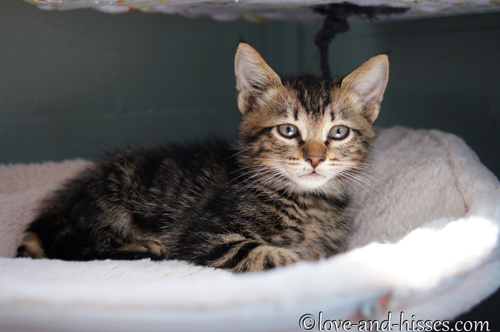 Teresa let her out with them, and she cornered Chanandler and hissed and growled at both the kittens. So much for THAT. 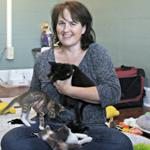 The same time that I dropped the Fakers off at Petsmart, I was picking up three kittens – Bubble, Squeek, and Barnaby Mouse – that I was kitten-sitting for Brittany from Forgotten Felines while she was in Uganda. 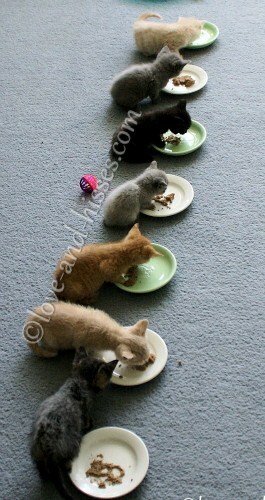 Talk about some CUTE kittens! 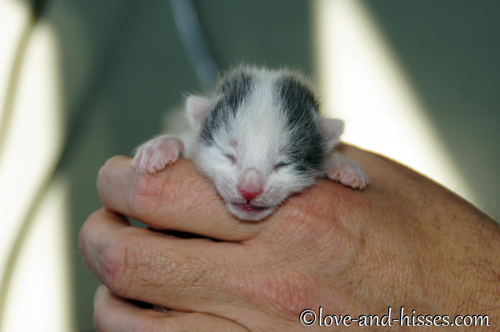 This picture of Barnaby Mouse and Squeek gave you some idea of just how tiny they were. I also posted one of my top five favorite pictures of the year – I still use this picture as wallpaper on my desktop. On June 3rd, we said goodbye to George. He was the very best good boy right up until the very end. I posted the tribute to him here. 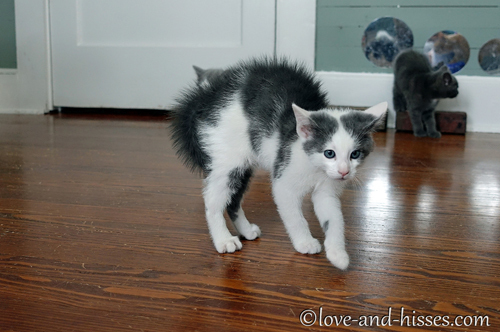 On June 7th, I introduced you to the new fosters, Tinker and JJ. 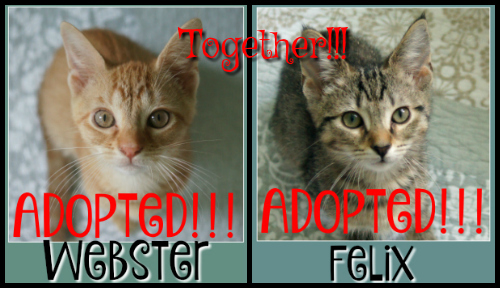 Or, as they were renamed, Felix and Webster. 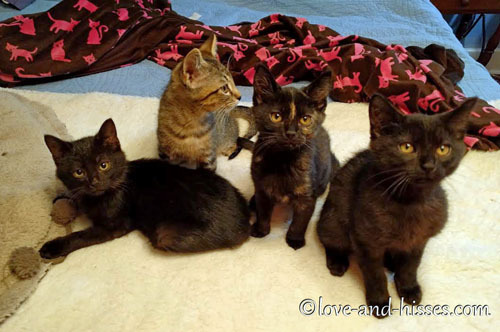 They were actually pre-adopted before they got to us, just needed to hang with us ’til they could have their last vaccinations and their new family was ready to bring them home. They were about 10 weeks old. 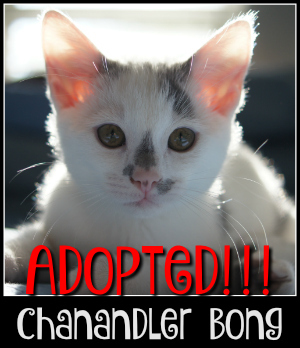 On June 8th, after a lonnnnng week and a half, Chanandler Bong was “finally” adopted. This left Ken Adams at Petsmart, and mama Regina Phalange also. 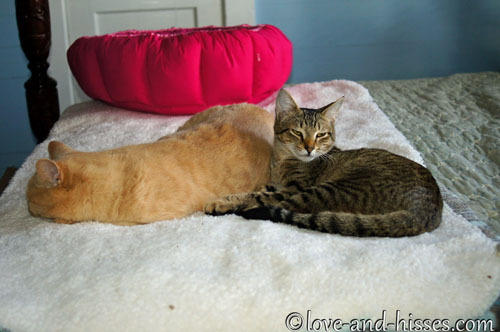 I mentioned that it was POSSIBLE they might be adopted together, but didn’t think Regina would much care for that. 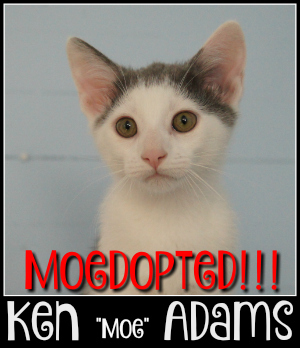 A few days later, Ken “Moe” Adams was adopted. And then Mama Regina Phalange was adopted! 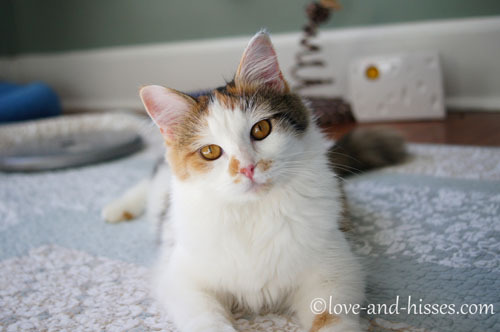 She was renamed Marie, and from the updates we’ve seen on Facebook, she is doing wonderfully well. 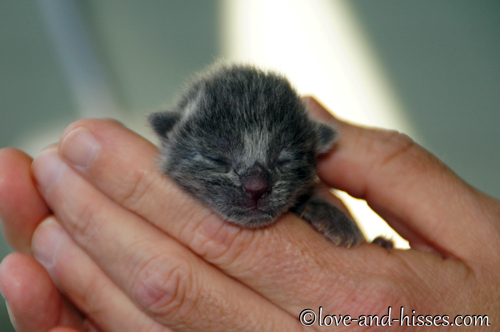 I think all mama kitties deserve extra special homes. In mid-June I mentioned that we were planning to sell Crooked Acres in a couple of years and move a little closer to civilization. This sent some of you into a tizzy, apparently envisioning that we were going to toss all the permanent residents out the car window on our way to a one-bedroom windowless apartment in the bad part of town. I attempted to set your minds at ease, but I suspect that some of y’all still harbor doubts. I KNOW HOW YOU ARE. 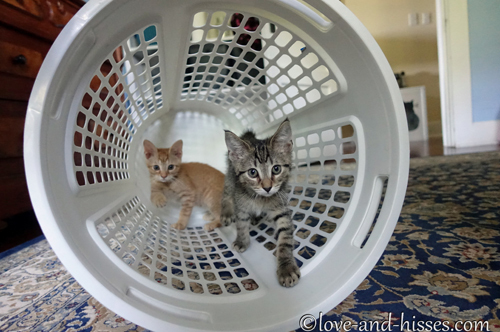 Webster and Felix underwent intensive laundry training. Felix worked on his Navy SEAL training. 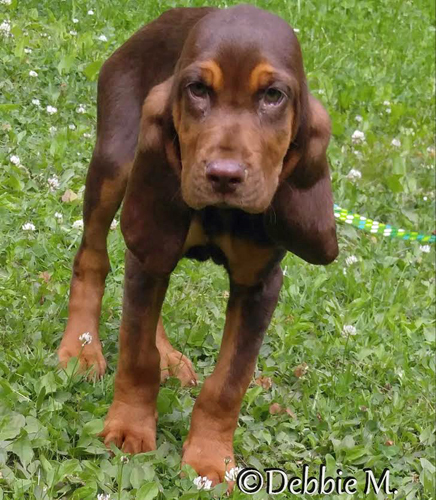 My nephew and his girlfriend, who were in Nashville briefly, came to visit and brought the cutest little bloodhound puppy with them. 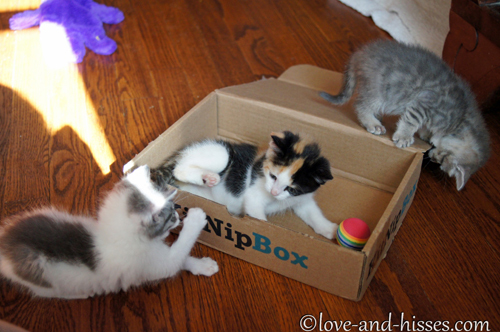 Barnaby, Bubble, and Squeek had one last tussle in the Kitnip box, and then they went back to Brittany. Webster and Felix learned about Uncle Archie in the June 16th post. 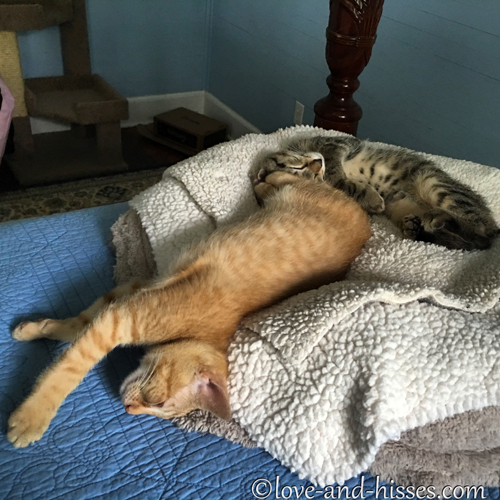 We had a couple of fairly low-key weeks with Webster and Felix, involving a lot of nap time training. And a lot of Felix and Webster having the run of the entire house. Dennis played nanny and made sure that Webster was properly clean. 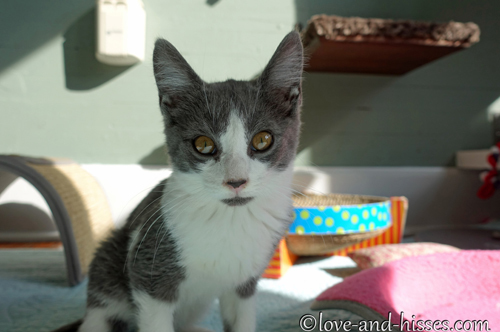 On July 5th, Webster and Felix went home, together. 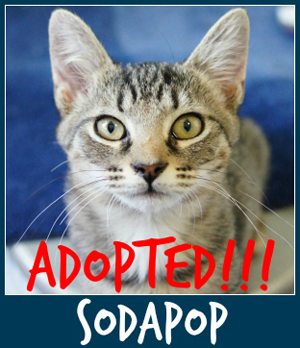 (This was no surprise to us, of course, since they were adopted before we even got them.) Cindy reported that they settled in just fine. It might not have been an accident that I waited ’til they went home before I shared this particular picture. So with the house foster-less, I went off to Maine for vacation (though naturally I pre-wrote and scheduled posts for while I was gone, because I didn’t want y’all to have to go without.) 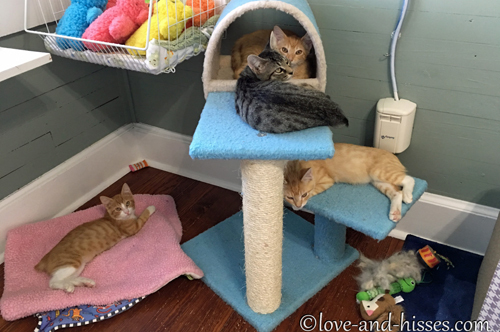 I got to see Connie (Tails from the Foster Kittens), Jeanne (Random Felines), and Kelly (Whiskers in the Window), and got some kitten and cat snuggles and a shelter tour. 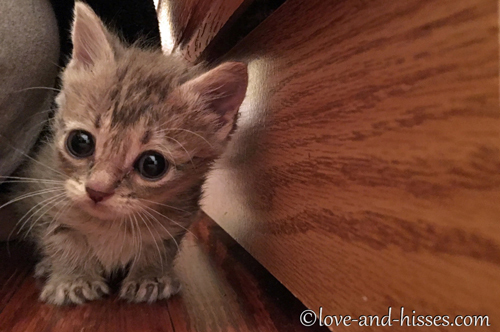 While I was on vacation, a kitten showed up, because of course it did. 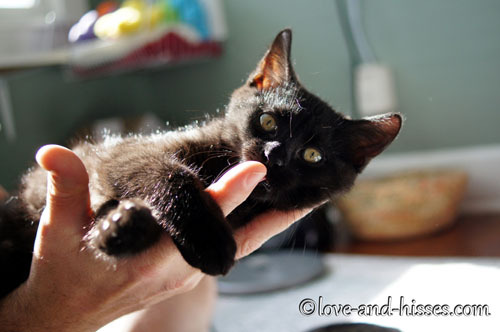 Fred eventually trapped her, and I came home to meet a floofy little black kitten. 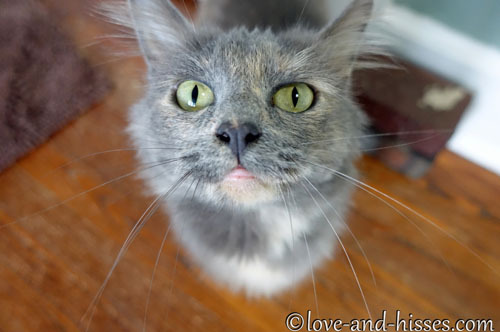 I initially named her Meowth, but we changed her name to Privet. 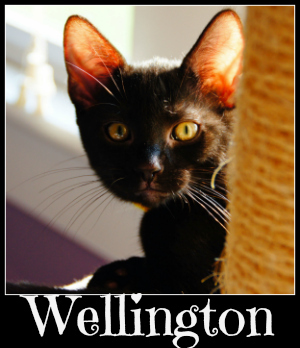 Winnie had kittens who were just about the right age to provide her with companionship, and they were already named. I introduced them all in the July 22nd post. 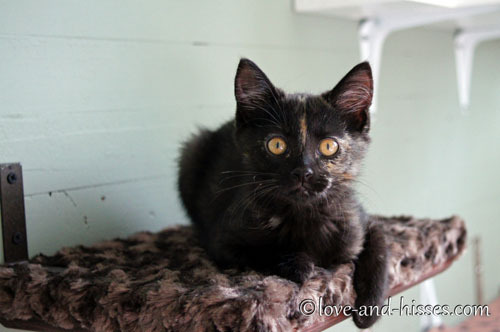 Then we got another Evergreen kitten, of course, because only a few days after I introduced Privet to her foster siblings, Winnie found me another kitten to add to the foster room. 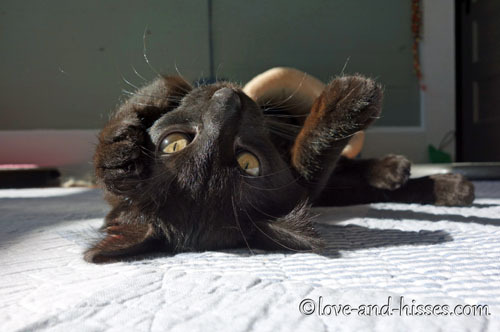 Hemlock was just a hot little mess – but more than that, a LUCKY little mess. 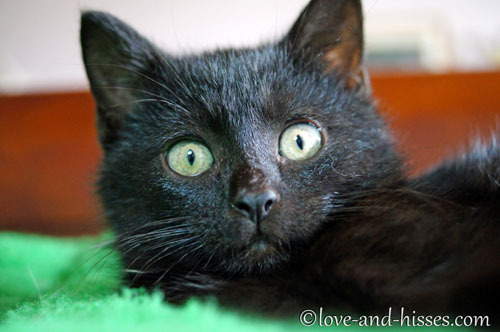 I teased y’all with that picture of him at the end of one post, and then on July 26th I posted tons of pictures of him and told the story of a lucky little Hemlock who, through a series of coincidences, ended up being saved and came here to us. 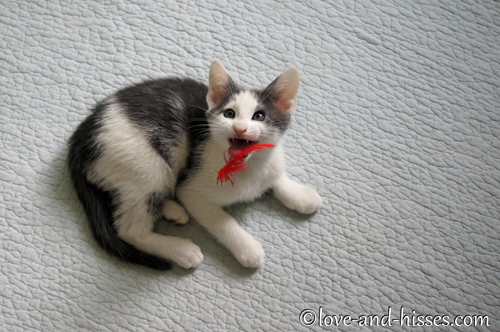 Remember Bubble, one of the three kittens I babysat for Brittany/Forgotten Felines before I went to Maine? 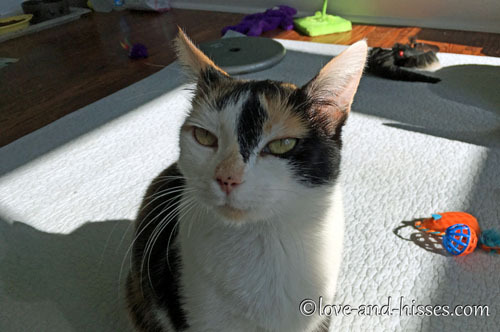 Sadly, she passed away unexpectedly. I posted about that sweet girl here. Rest in peace, sweet baby. 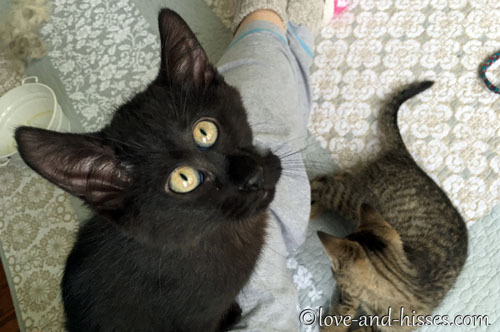 It took Hemlock no time at all to become buddies with his foster siblings. The Evergreens, all in one picture! Cypress, Hemlock, Spruce, Juniper (front), and Privet. On August 8th, Uncle Stefan came a-visitin’. There was very little floof-suit donning, actually. Cypress, Juniper, and Spruce went off for their spay and neuter surgeries, and Spruce and Cypress headed off to Petsmart. 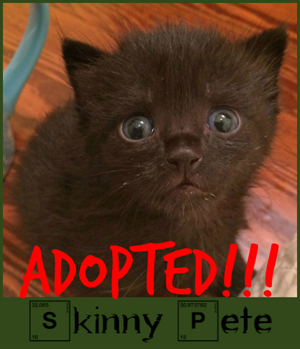 In the August 22nd post, I gave some backstory about Skinny Pete, starting with this collage. And ended it by telling y’all that – SIGH – she’d been returned due to a move. This is what she looked like in August. 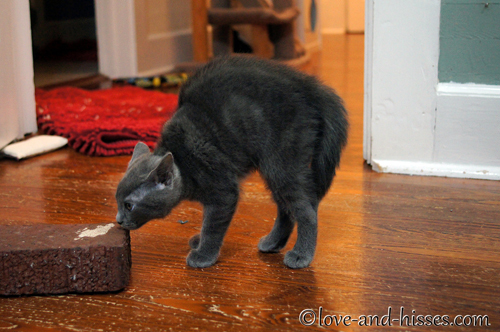 In the same post, I mentioned that Hemlock, Juniper and Privet were adjusting well to having Cool Unca Stefan around. Privet and Hemlock headed off for their spay and neuter, and then we just waited until there was room for them at Petsmart. 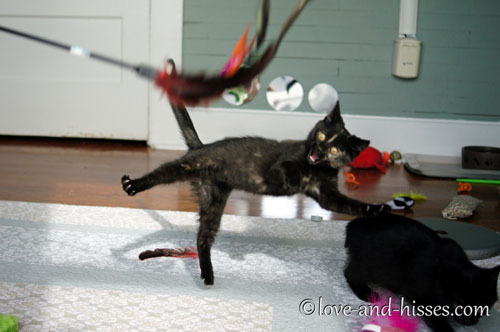 This slow-mo video of Juniper leaping for the feather teaser still just kills me dead. 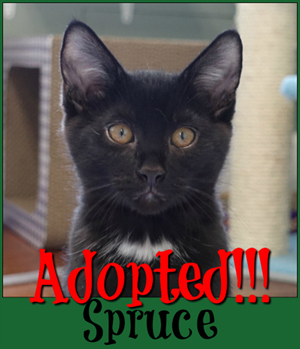 On September 5th, I announced that Spruce had gotten himself adopted. 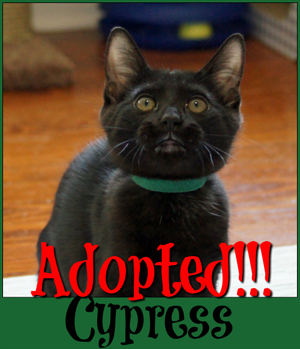 And warned y’all to start clutching your pearls, because Hemlock, Privet and Juniper would be headed off to Petsmart later that week. 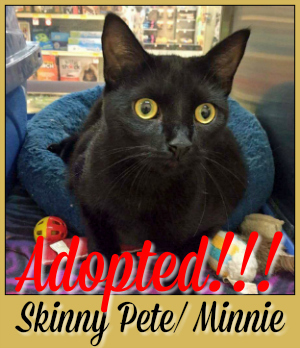 Kathie managed to completely empty out the foster room, doing four separate adoptions in one night – including Cypress and Skinny Pete/Minnie. 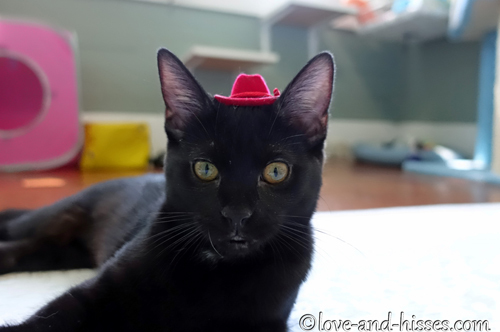 Hemlock, Privet and Juniper headed off to Petsmart, but not before I broke out the tiny (and not so tiny) hats. I adore those pictures so much, I can’t even tell you. With an empty foster room for a whopping two – TWO – days, I introduced y’all the the new guys, the Greasers, on September 12th. 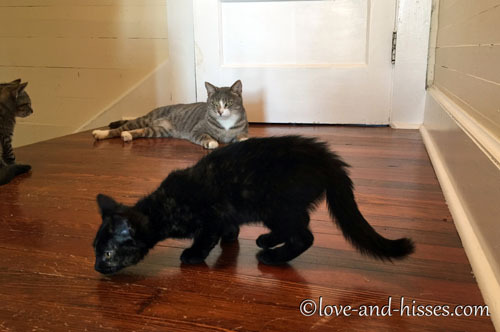 They were skittish little monkeys – trapped as part of a TNR project – but with some time, attention, and the judicious application of chicken baby food, they decided I wasn’t 100% terrible. 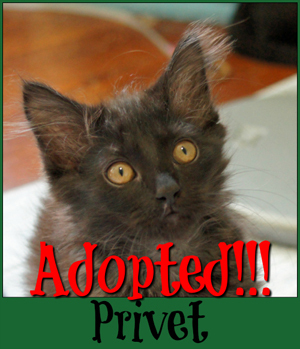 Privet got adopted (I was relieved, because she was the one I worried the most about). I got plenty of pictures of the Greasers in that corner; they spent a lot of time hanging out there at first. As they got more confident, they moved out into the room. Ponyboy showed off his super loud purr. I introduced y’all to our new girls. 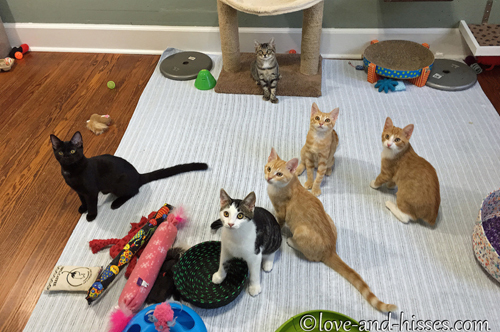 The Greasers went off to be neutered, and when they came back here, they had a couple of friends for a few days – faces that were familiar to y’all. 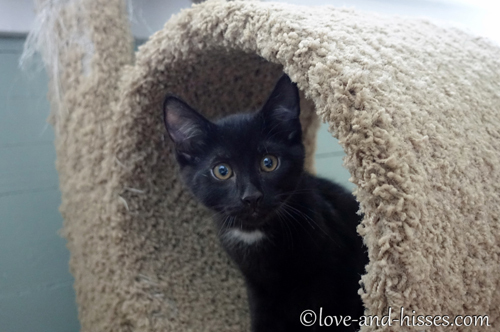 Hemlock and Juniper had developed litter box issues while at Petsmart, and needed to come back here for a week. 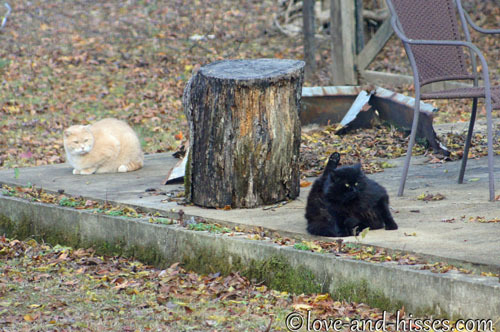 The Greasers were confused and everyone hissed at everyone, but it was half-hearted. This picture of Ponyboy still makes me laugh. Trust me – you do NOT want to see the unedited image. 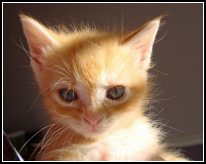 It was before he was neutered, and NO ONE needs to see that. 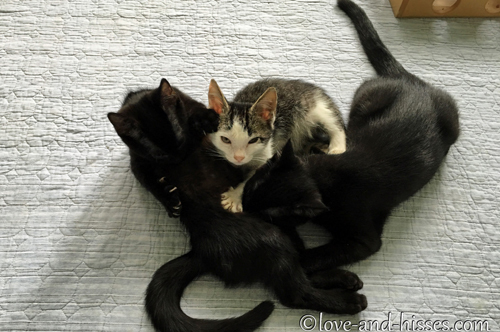 Hemlock and Juniper eventually made friends with the Greasers. 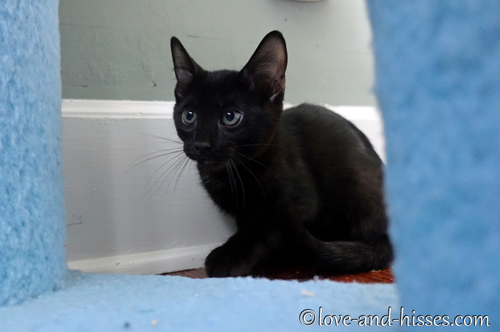 A week after I threw Hemlock and Juniper in with the Greasers, Hemlock had pretty much totally integrated. Hemlock and Juniper went back to Petsmart, but not before I managed to get a picture of them both along with all four Greasers. 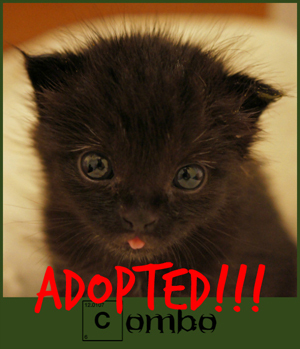 Hemlock got adopted, leaving Juniper behind. 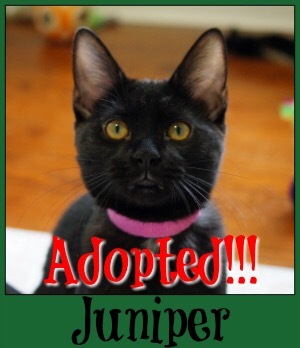 But that’s okay, because then Juniper got adopted! Then I was supposed to go on vacation to Myrtle Beach, but due to the hurricane blowing through, my vacation was canceled. Since I’d planned on going and warned y’all that I wouldn’t be posting, I felt okay actually taking the week off from posting. 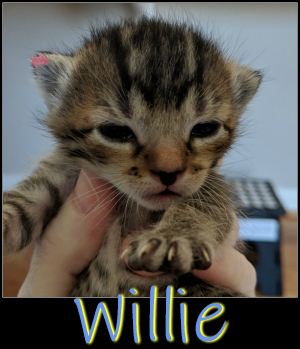 The instant I realized my vacation wasn’t going to happen, I called Winnie and demanded she hand over my newest fosters, kittens I named after towns in North Carolina and South Carolina and called, not surprisingly, the Carolinas. 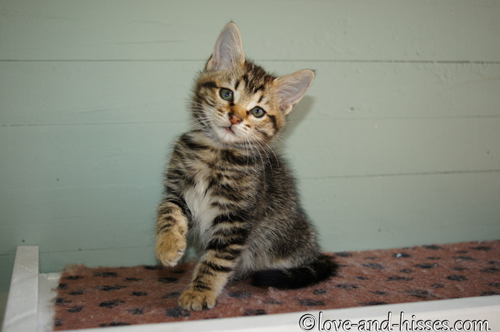 We started off with four little brown tabbies, just under six weeks old when I got them. 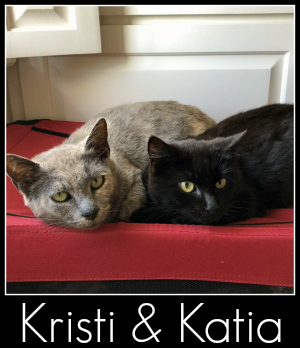 They’d been trapped at a local car dealership along with their mother, who was spayed and released. They were little scaredy cats at first, but the magic Gerber chicken baby food won them over. 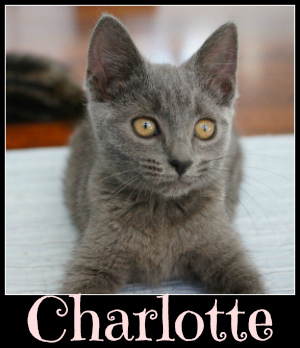 The very next day, I teased you with a picture of Charlotte, the little gray cutie pie caught by Winnie in an overgrown vacant lot, and then introduced her properly the next day. 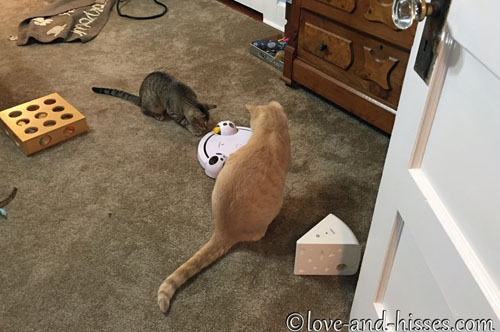 We guesstimated her to be a bit older than the brown tabbies, so we threw her in with them and played a relatively calm game of MEET YER NEW PARTNER! 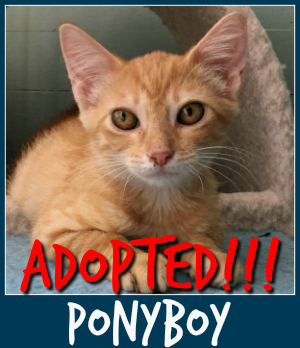 Kathie had another amazing adoption night at Petsmart and ALL of the Greasers were adopted out – Two-Bit and Ponyboy were adopted together, and Darry and Sodapop were adopted out singly. The Carolinas met Uncle Stefan, and there was a bit of floofin’ going on. 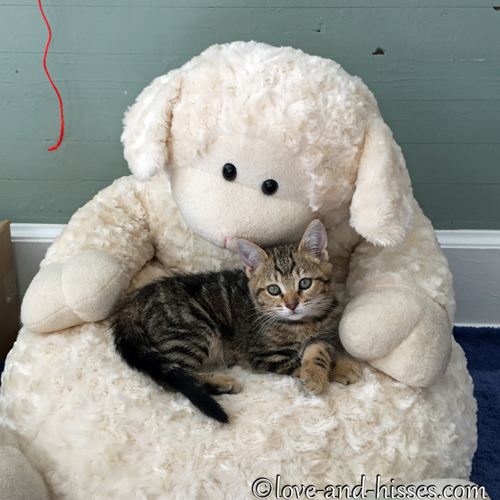 We got a big stuffed lamb chair for the kittens from Selena, immediately named it Lambie Pie, and the kittens thought it was rather super cool. Iva with her paws crossed because she’s a LAYDEE. Halloween came and with it were several of the permanent residents, all dressed up and ready for their candy. My particular favorite was Stefan Ingalls. I actually did go off to Myrtle Beach without telling y’all, but pre-wrote and scheduled posts for while I was gone. When I got back, it was time for another scintillating round of MEET YER NEW PARTNER, where we threw Aberdeen (Abby) in with the rest of the Carolinas. 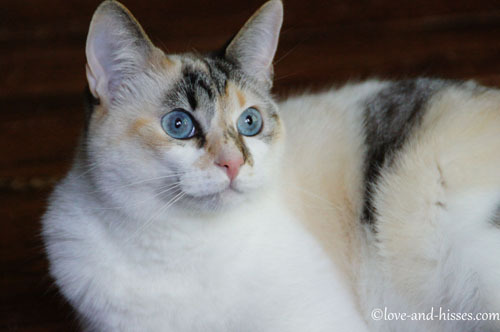 Abby was trapped by Winnie in Huntsville in a location that made it possible that she and Charlotte might be related. Obviously there’s no way to know for sure if they’re sisters or not, but I certainly wouldn’t be surprised. 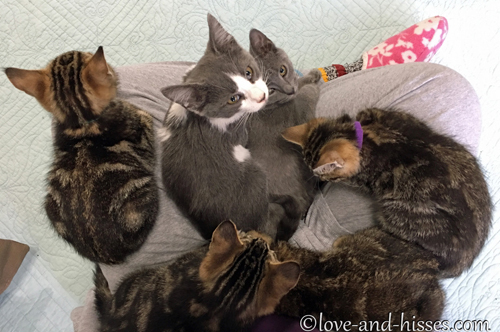 There was a lot of hissing between the rest of the Carolinas and Abby, but after a few days they worked it out and I was able to capture a picture of all six of them in my lap at one time. 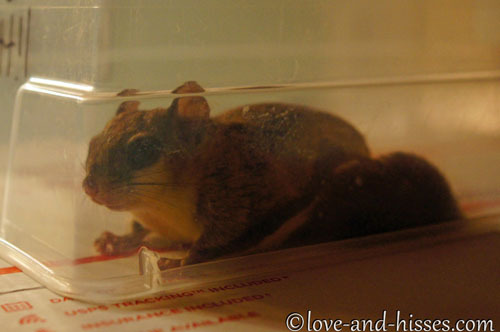 We had some Wild Kingdom excitement one night – I was laying in bed reading when I realized there was an awful lot of noise in the front room, including some squeaking. Turned out that Alice and Jake had discovered a flying squirrel. I woke up Fred and after some craziness, we got it trapped. It was adorable, but I couldn’t convince Fred to keep it as a pet, so off it went, hopefully to join its adorable family. 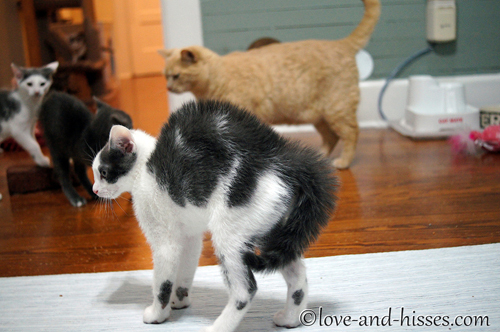 Stefan went into the foster room to hang out with the kittens, and it went well until it suddenly went terribly wrong. 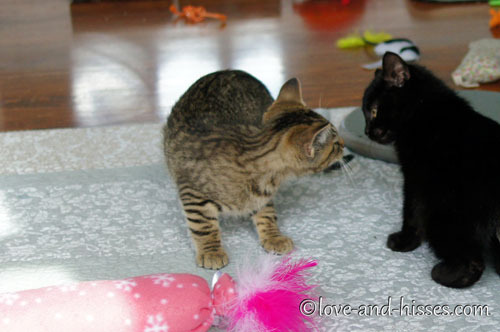 The kittens went off for their spays and neuters, and when they came home, they had YET ANOTHER new partner to meet. Yes, that is Dustin. 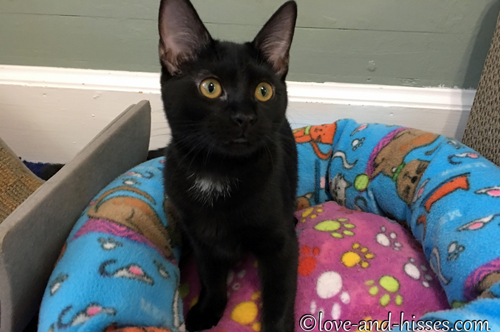 With the Carolinas being just about ready for Petsmart, Susan asked Fred if he’d work with the scaredy cat and hopefully help instill some confidence in him. 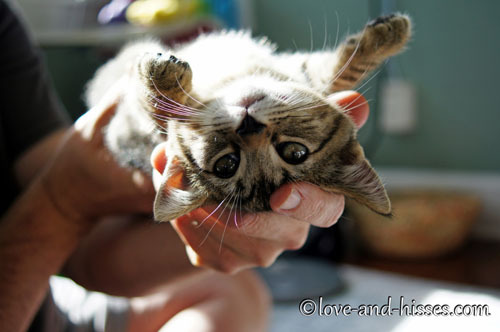 Fred agreed, and I picked him up the morning that I dropped off the kittens for their surgeries. 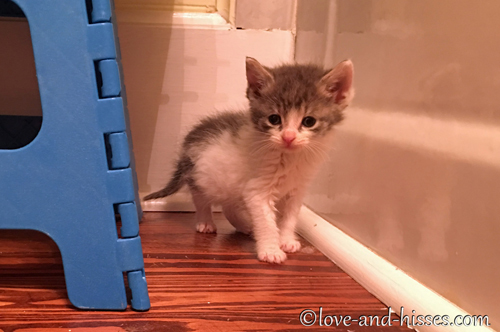 The plan was to let him stay in the foster room with them at night, and put him in the big bathroom during the day. It was just for a few days, and it worked out fine. 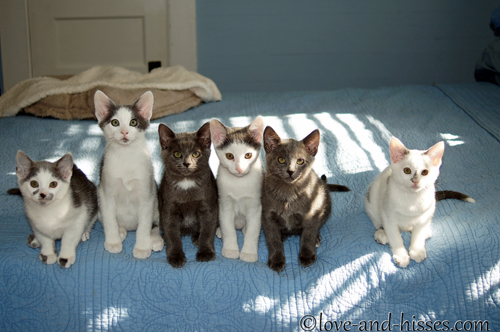 I got a shot of all six of the Carolina kittens. And a few days later, they headed off to Petsmart. 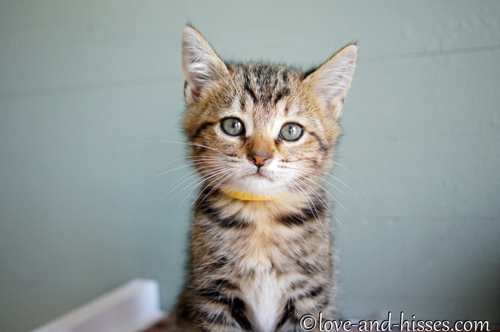 Not surprisingly, there were a couple of adoptions the same day they were dropped off. 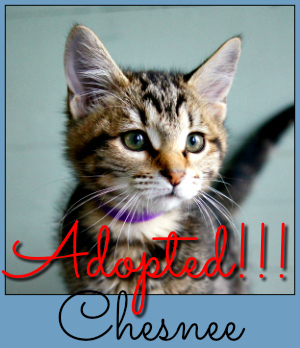 Aberdeen and Chesnee were both adopted, separately. 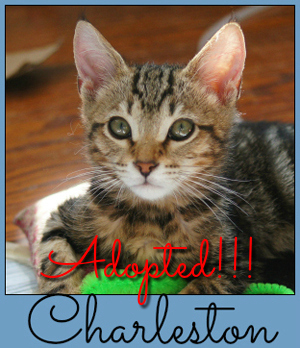 A few days later, Charleston was adopted. 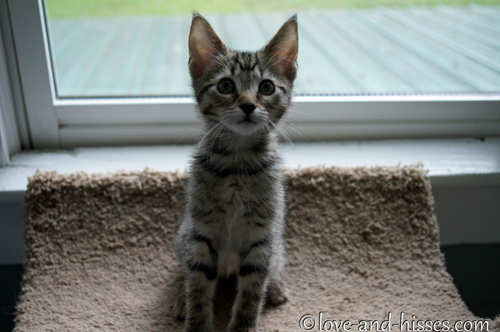 I did a Throwback Thursday post about Creed, our foster back in 2009, who had been returned not once, but twice. The most recent time he was returned was in 2014. 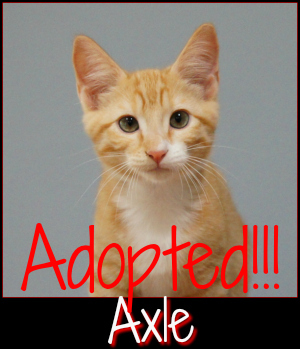 Since then, he bounced back and forth between the shelter and Petsmart. Being at Petsmart was stressful for him, and he overgroomed. 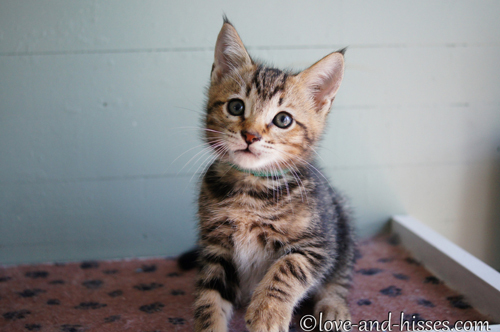 We were starting to worry that he’d end up at the shelter forever. 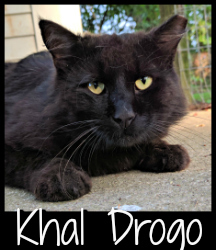 Being at the shelter is certainly NOT a terrible thing – the cats at the shelter are well cared for and have a very large room, with access to a screened porch, lots of cat trees and snuggly places to hang out – but he’s such a love that we wanted him to have his own home. 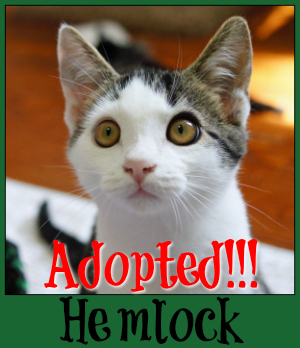 And then, at the end of that post, I was able to announce that finally he’d been adopted by a WONDERFUL family. 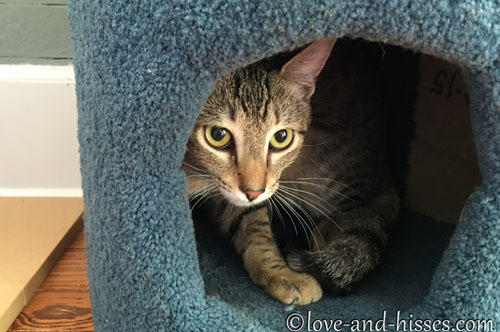 Dustin moved from the foster room to having the run of most of the upstairs, and showed us that he REALLY likes other cats. And then I told y’all why he only got the run of “most of” the upstairs. Y’all got to meet Willa. 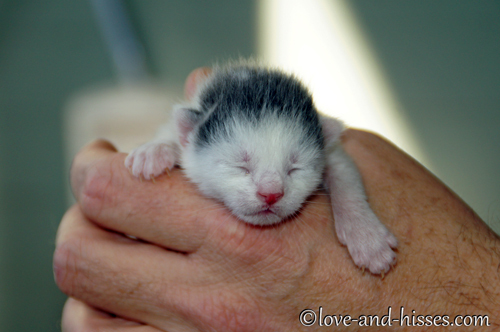 She was dumped on someone’s property, and I confessed in the December 14th post that the entire reason I was willing to toss Dustin out of the foster room and take Willa was because I was told she was hugely pregnant and ready to pop at any moment. I could tell when I picked her up that she was not at ALL “ready to pop”, but I was willing to wait and see if she was pregnant. Dustin continued to get along with the permanent residents, especially Uncle Stefan. 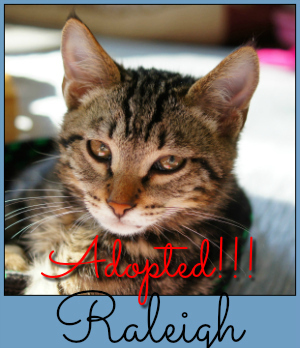 A few days later, though I somehow failed to mention it in the blog (I did mention it on Instagram/Facebook/Twitter), Iva and Raleigh were both adopted, separately. To save us from waiting to see if she was pregnant, Willa helpfully went into heat. 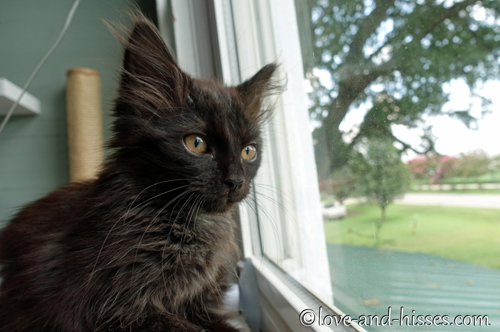 I whisked her off to the vet immediately, and she was spayed and id chipped and got her first vaccinations. In the December 20th post, I confessed that we’d introduced Dustin to Willa the week before, and she went after him. As a result, he’s terrified of her. Fred declared that she needed to be an only cat, but we’ve since learned that as long as the other cats aren’t cowed by her and are willing to stand up to her, she’s fine. She got ALL up in Stefan’s space a couple of times, and he just looked at her like “What?”, and she backed off. On December 21st, Newt fumed at Fancypants v2.0. Dustin continued to have the heart eyes for Stefan, and we started to let him have the run of the house at night, which he liked quite a bit. We had a Merry Christmas, and wished the same for y’all. Then we wished y’all a Happy Boxing Day, and the cats weren’t the only ones who appreciated the comfort of a box. 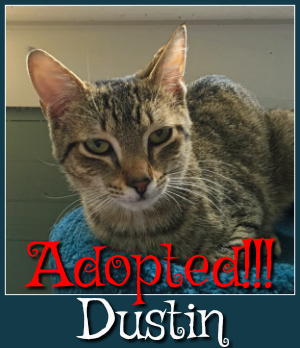 Dustin made the leap from foster to permanent resident, giving us 10 permanent residents again. SIGH. And Dennis remains heart-stoppingly beautiful. So, if you include the fosters we started the year with (Adele, Pink, Stefani, Levine, Shelton and Nubbs) and the one we’re ending the year with (Willa), we had 36 cats and kittens move through here (including Bubble, Squeek and Barnaby Mouse, who I was technically just kitten-sitting, but I think I get to include them in the total, don’t you?). 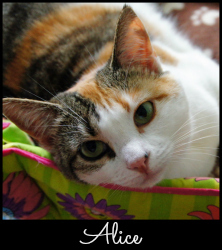 There is currently only one unadopted foster, Willa, so we’ve had 32 adoptions this year. 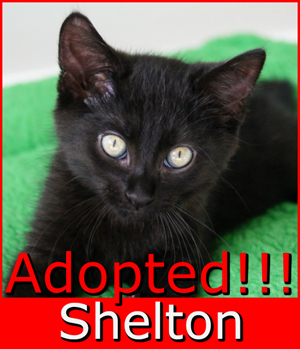 Elijah and Skinny Pete were both returned this year, but then adopted out. 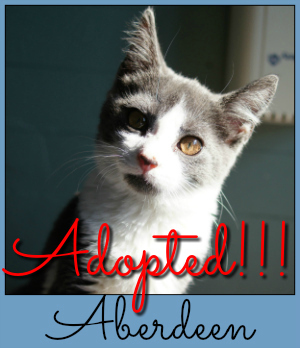 Creed, who was returned in 2014 was – to everyone’s delight – adopted a few weeks ago. 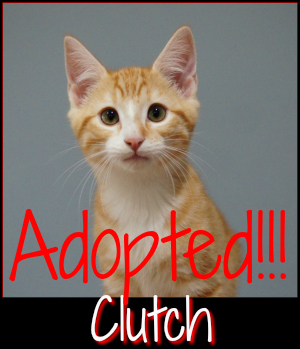 We have now fostered a total of 318 cats and kittens (which includes Bubble, Squeek, and Barnaby Mouse). 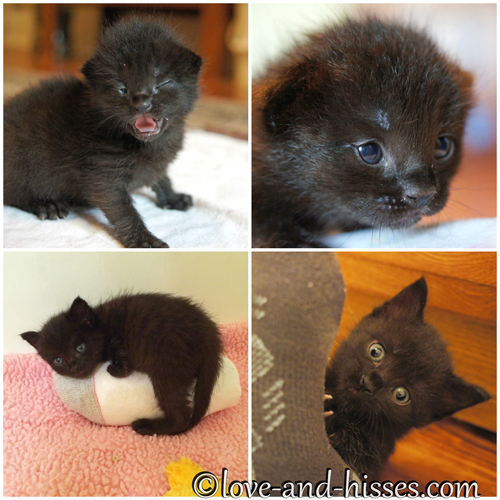 Want to see this year’s fosters in one place? You know you do! Here they are – click on the picture below to see the full-sized version over at Flickr. 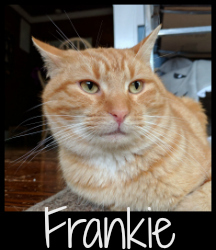 Former Foster Updates we received this year. Note: There were actually more updates than this, but they were shared over at Facebook and I (a) didn’t keep track of them, and (b) didn’t think to bring them over to the blog. 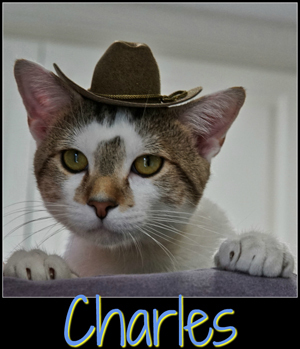 So what I’m saying is that if you love updates, it would behoove you to check out the Love and Hisses and Challenger’s House Facebook pages. True Blood Terry – February 17th, September 1st. 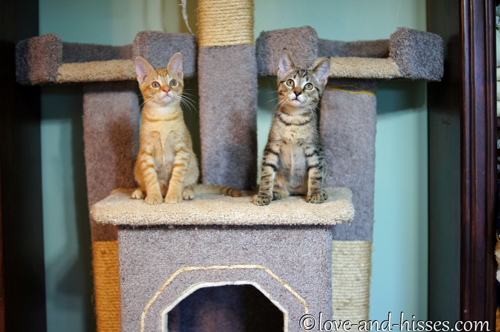 Charming and Jareth (now Toby and Sooty) – December 16th. 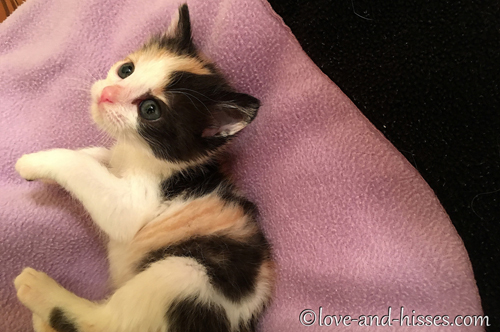 Khaleesi – May 16th, November 14th. 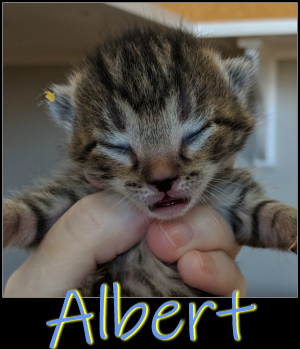 Norbert – May 2nd, July 8th, September 21st. 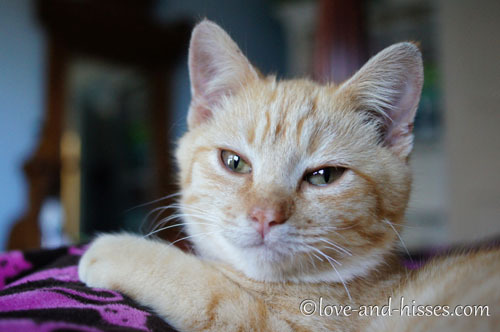 Lucy (now Gilly) – November 28th. 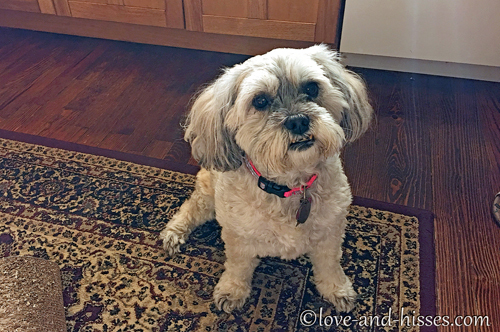 Shecky (now Gir Shecky) – January 7th. Ambercup (now Amber) – August 25th. 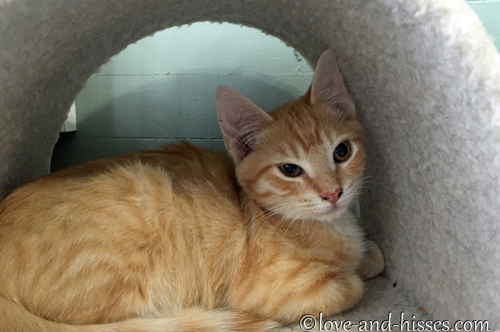 Pattypan (now Peanut) – March 21st, September 15th. 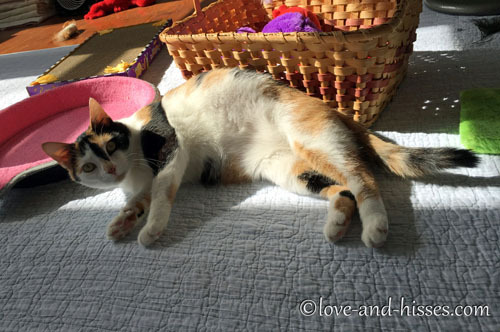 Calabash (now Calliope) – August 1st. 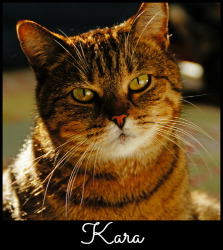 Torres (now Sasha) – March 21st, July 25th. 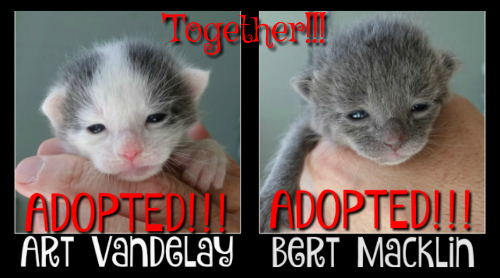 Art Vandelay and Bert Macklin (now Patches and Periwinkle) – July 8th. 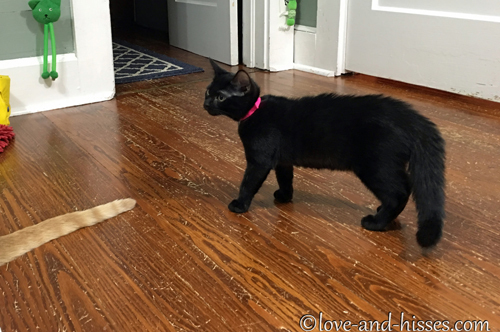 Juniper (now Branwen) and her brother Drum, who was our foster back in – October 27th. The state of the permanent residents in 2016. 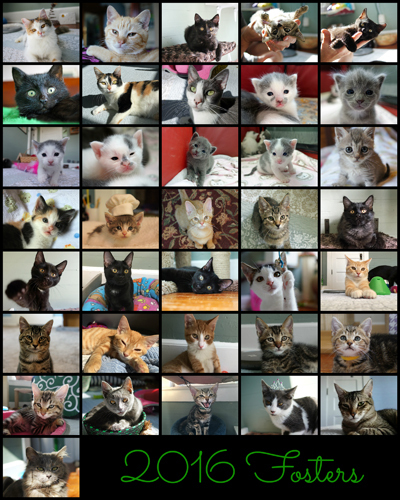 We began 2016 with 10 cats and one dog: Maxi, Newt, Stinkerbelle, Kara, Joe Bob, Jake, Alice, Stefan, Dennis, Archie, and George. 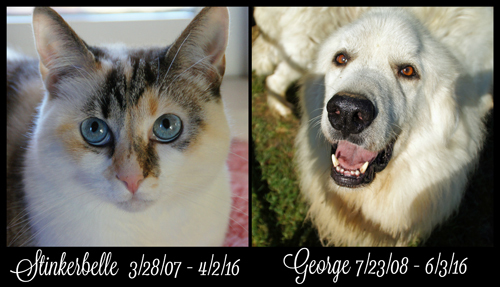 While 2016 didn’t approach the awfulness of 2015, we were very sad to lose Stinkerbelle in April and then George in June. In retrospect, we should have seen both of them coming. I still believe that Stinkerbelle died of a broken heart after losing her beloved Tommy. And after saying goodbye to Gracie last year, George became an old man overnight. We knew that the end was coming with him, though we wished it wasn’t so. It’s strange not to see those two polar bears gallumphing around the back forty. 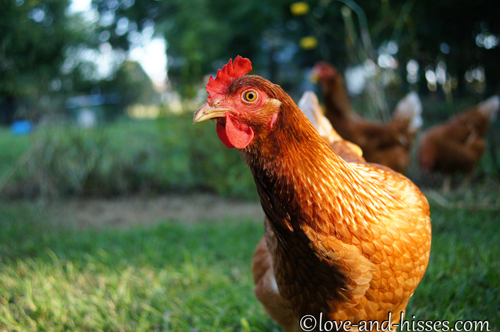 We have – luckily – not lost any chickens since his passing, and hopefully our luck will continue to hold. I don’t know what 2017 will bring – I’m hopeful that everyone we’re starting 2017 with will still be around at the end of it. I hope that no one suffers any severe injuries. Is that too much to hope for? Probably, but I’m going to throw caution to the wind and hope for it anyway. I’m just going to go ahead and repeat what I said last year, and the year before, and the year before, and the year before that. As we begin this new year, I’d like to take a moment to thank you all for reading. 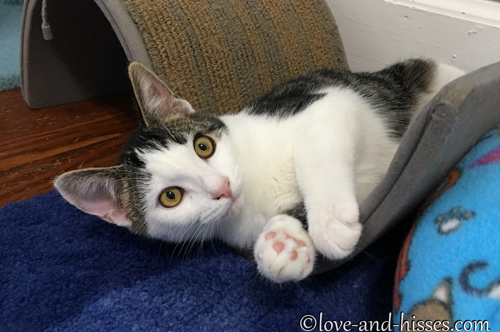 I know that a lot of you say that you like to start (or end) your day at Love & Hisses, reading about the kittens and the permanent residents. 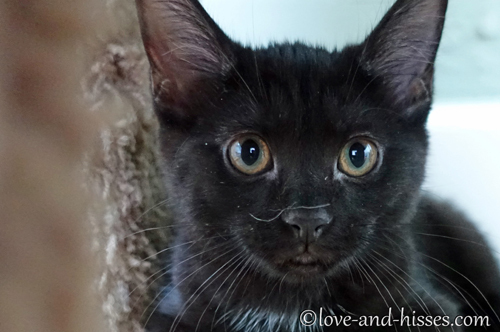 You give me (and each other) advice, ask and answer questions, fall in love with the kittens we foster and our permanent residents, and grieve with us as we’ve lost permanent residents. 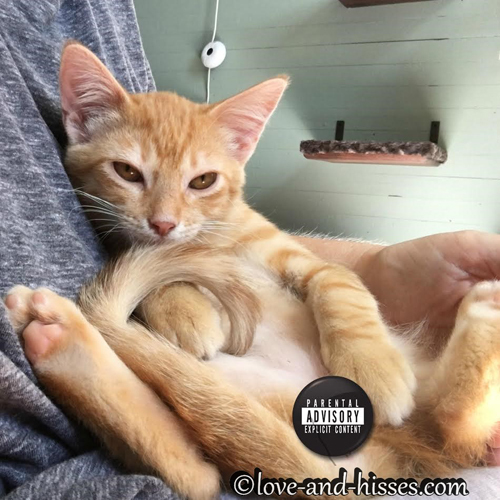 I started this site because I can’t shut my face about cats and kittens, and to have y’all enjoy the pictures and stories I post means more than I could ever begin to express. I appreciate each and every one of you, whether you’re here every day or just come by every now and then. We’ve built an amazing community here, and I certainly could never have done it alone. So, from the bottom of my heart, thank you all so very very much! 2013: When Rick walked through the door after running an errand, the permanent residents all went running away from him. 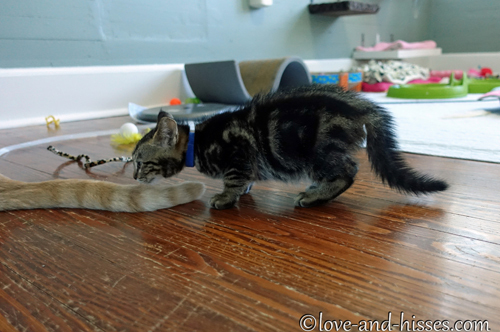 Stripey and Sungold, on the other hand, ran toward him to see what was going on. 2012: In a fangy kinda way. 2009: Marion enjoys her some Dog Whisperer. 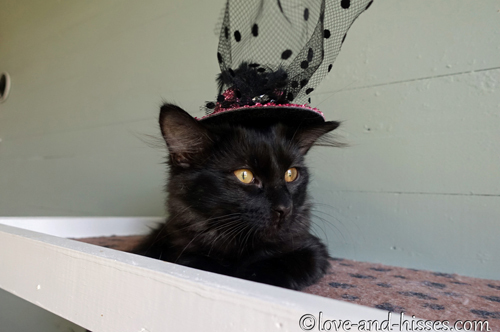 Happy New Year Robyn, Fred and all the adorable permanent residents of Crooked Acres:-) I enjoy each and every morning starting my day by reading your blog. 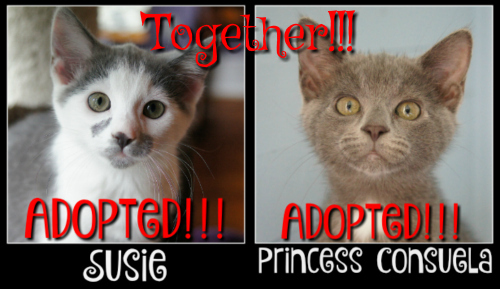 Thank you so much for all that you and Fred do fostering these beautiful babies and to Challengers House as well for finding them their fur-ever homes. 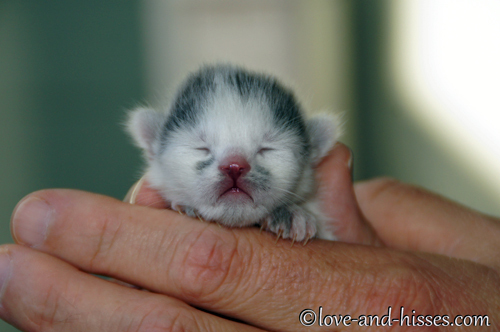 May 2017 bring you peace, health and many more sweet babies to find their way to loving homes. Rescues are absolutely the best! My current two have given back to us many smiles and love over the past year and I believe they rescued us. Cannot imagine my life without them! 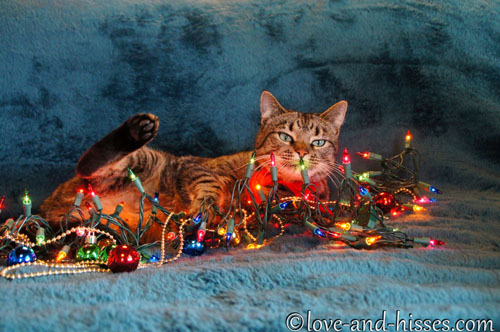 Happy New Year’s wishes out to all the Love & Hisses blog followers as well! I for one am very glad that you can’t shut your face about cats and kittens. And you will be reading this several times today (and rightly so!) – but thank you for being a ray of sunshine in this chaotic world. 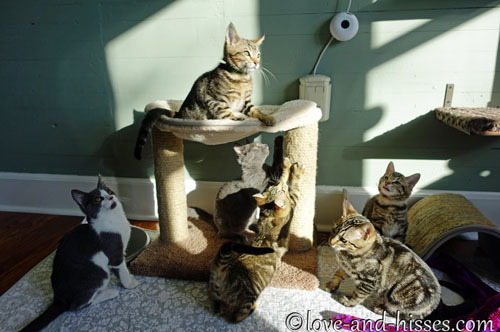 I still think there should always be a basket of kittens and puppies in the middle of any room where there are governments/bankers/CEOs meeting/negotiations taking place so that maybe the world could lighten up a bit. 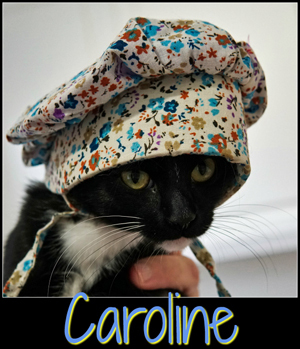 A happy, healthy and purrful 2017 to every one at Crooked Acres!!! 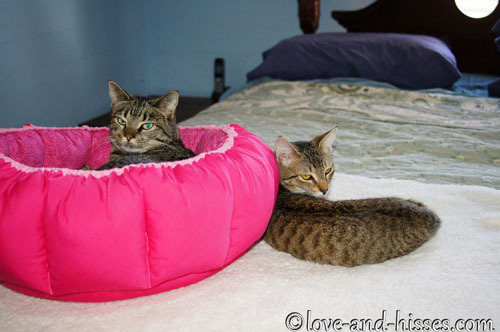 Thank YOU Robyn, for this blog, among your other endeavors. I’ve been reading since 2010 (maybe 2009? Is that possible? 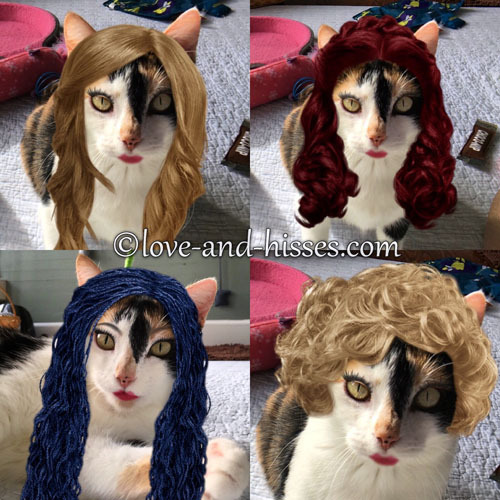 ), and in the time I’ve been reading I’ve gotten married and had a child (who is now 4 years old and enjoys looking at kitty photos and videos as much as I do). I’ve fostered/rescued/TNRed/foster-failed a few of my neighborhood stray cats with your help and inspiration, and the zucchini tot recipe from DCEP has become a family favorite–I even went there recently to find the cookie recipe I sent in (Mrs. Dooley’s) when I couldn’t find my copy (pro tip: crushed candy canes on top make a nice peppermint version for the holidays). 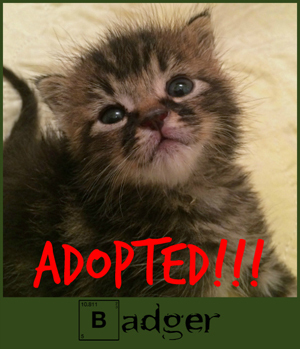 So, thanks again and happy New Year to you, Fred, and all the permanent residents and fosters. We love seeing what the Anderson fosters are up to every day. Here’s to another great year in 2017! Wishing you, Fred, and your beautiful fur family every happiness and a healthy 2017! You both are kind sweet people (should be a model for humanity), funny, and talented! Thank you for sharing all you do, it makes my heart smile and see that there is good in the world!! Wait just one cotton-picking minute, young lady! 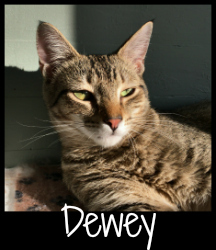 How did you get from “Dustin – whatever his name is, we’re still working on that” posted Friday to “Dustin (now Dewey)” on Monday with no explanation? Not all of us do Facebook (assuming there might be more detail there), you know 🙂 The name is lovely, but some of us (ok, “I”) would like a little more info (pretty please and if it’s not too much trouble). Other than that little detail, I really loved your recap! Fair enough 🙂 Just wanted to make sure you knew we noticed! 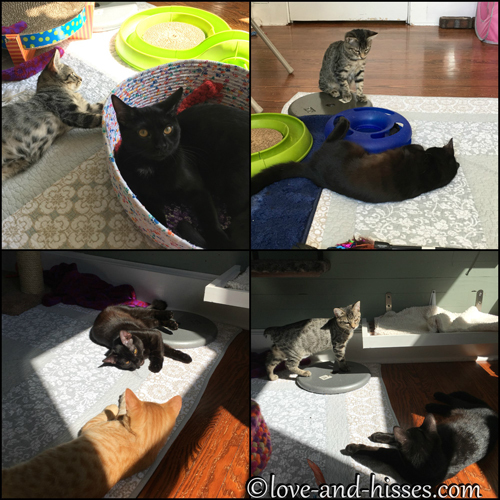 Love, love, love this blog AND all you do for the critters!! thank you so much, and yes, here’s to a Happy 2017! Happy new year! When you get to questions, I have one… with so many cats in the house you must have to deal with their water dishes in some way. Do you wash them weekly or something? 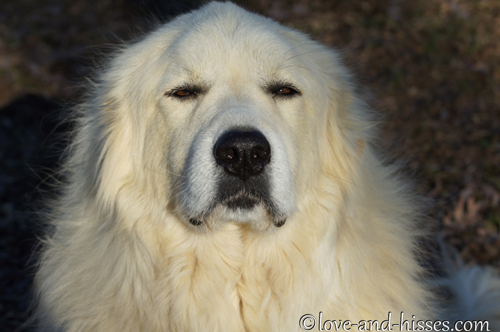 I have a neighbor who told me her dog gets bladder infections if she waits too long between dish washings. On the one hand I thought this was weird, as the bacteria would have to survive the intestines without causing harm, then cross the intestinal wall into the bloodstream and pass through the kidneys without causing harm, which all seems pretty unlikely (water they drink doesn’t just go straight to their bladder!). On the other hand I’ve had three unexplained bladder infections in the past three years so I wondered… I use a water additive to help with teeth so I don’t necessarily dump out all the water super often, and I have to use big heavy casserole dishes because I have too many dabblers and spillers. Thanks for the enormous amount of work. It fun the review with you. Nubbins still has my heart. Any updates on the Dear? You are the highlight of the internet day ! Did you not have any births in your house in 2016? The newest kittens looks to be the Fakers? You had two fake pregnancies and no births! 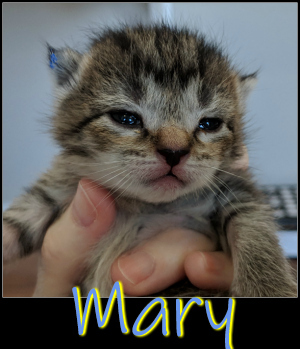 Thank you for this great update and all of the time you spend helping the kittens and cats and letting us know how they are doing. I really enjoy starting my morning with a smile with your FB page!! Happy NewYears to the Andersons and everyone I the L&H community. May 2017 be a banner year doe us all!!! What a year! 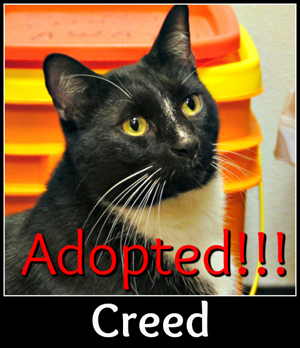 We’d somehow missed Creed’s adoption and are THRILLED about that. Thank you for sharing everyone with us and for all you do! I read this post while taking breaks between being Zsa Zsa’s chambermaid, general household chores and cooking. Lots of work preparing this, thank you Robyn! Happy New Year. May 2017 bring only joy and bliss. Your 2016 overview was amazing. 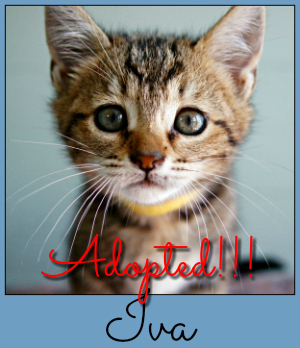 So many beautiful souls saved and now have forever homes…two of your beautiful souls crossed the bridge. They will forever be missed. Thank you for everything you and Fred do. Thank you for all your efforts with this blog. It brings joy to many people and a “connection” to us all. 2016 Christmas Eve claimed my wonderful Emma. Best thing I ever got from Chick Fil-A. I think she was 16-17ish. Renal failure. Thank you. Sadly, we are never ready……. What a year it’s been at Crooked Acres. Thanks for the daily updates and this super duper round up. I’ve been a reader since back in the OFB days and kudos to keeping a blog going in one form or another for all this time. 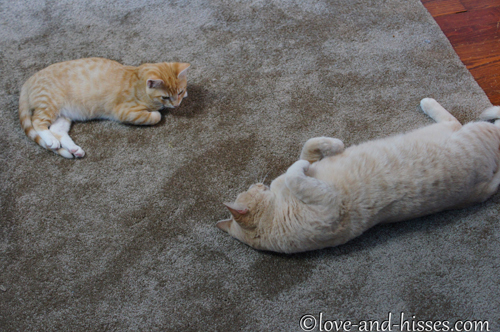 Like so many others, I love shots of kitties doing their kitty thing. All the best for 2017, I hope a real pregnant mama cat crosses your doorstep this year. Hi Robyn, this was such a lovely post to read. Hilarious, sad, and joyous all mixed in. Thank YOU for writing every day and allowing a bunch of crazy cat folks into your and Fred’s Crooked Acres life. 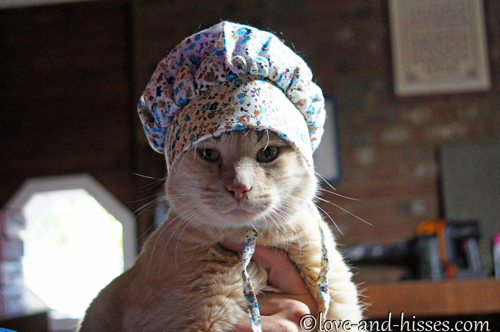 You let this city girl live out her ‘farm life and 10 cats’ fantasy life vicariously through you. My partner thanks you for this too. haha. 😉 Here’s to a fantastic 2017! Thank you for giving me a case of the sobs, a case of the giggles (Felix worked on his Navy SEAL training. 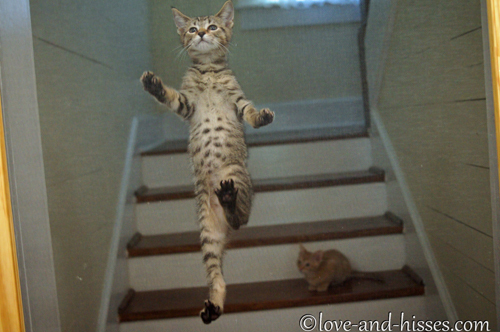 ), and a serious case of kitten fever.. Happy New Year! Thank you for all you and Fred do. I’ve been reading since Bitchy Poo, I can’t believe it’s been that long. But it just goes to show how much you connect with so many of us in so many ways. Here’s to 2017! As per usual your captions make me LOL. Today it was Stefan Ingalls and the caption “God I hate him.” I don’t know why but it totally struck me funny. Love it! Love your recaps, thank you for taking the time!!! Happy New Year!!!!! We thank you and Fred and all the Crooked Acres gang for the fun start of each day!